Leonard’s is a lively, distinctive skipper which has probably been in New England since the post-glacial prairie extension warming period. It may be declining today. Thaddeus W. Harris identified this species, naming it in honor of the Reverend L. W. Leonard of New Hampshire, who formerly lived in Boston, where Harris met him. Rev. Leonard provided Harris with his first specimens of H. l. leonardus (Harris 1862: 314-5, fig. 138; Index; Elliott 2008). These historic type specimens reside today in the Harvard Museum of Comparative Zoology (Type #26350). The type locality for at least one is New Hampshire, but other specimens could just as likely have been taken in Massachusetts (Pelham 2008). In Harris' personal collection at the MCZ, there are three specimens of H. l. leonardus, from Rev. Leonard, dated September 1, 1827 (Index). Pelham (2008) recognises our eastern Leonard's Skipper as subspecies H. leonardus leonardus. Others have lumped it with the former Pawnee Skipper (H. l. pawnee) based in the upper midwest, seeing clinal variations between the two races (Scott and Sanford 1981). This account applies to our eastern subspecies. In 1889 Scudder reported the species as uncommon generally in Massachusetts, citing specimens from only two inland locations, Andover (F. S. Sanborn) and the Pelham Hills near Amherst (8/17/1874; H. W. Parker 1874). But there are many other turn-of-the-century records which Scudder does not mention: for example F. H. Sprague apparently had no trouble finding Leonard's in Wollaston, taking specimens in 1878, 1883, 1885, and 1887, fourteen in all, and also in Malden in 1883 and 1895, eleven in all (specimens in MCZ; Sprague 1879). At Boston University today are early specimens from Sherborn (E. J. Smith, 1890's), Swampscott (L. W. Swett), and Milton (H. H. Newcomb, 1900). There are two West Newton specimens from 1900 in the MCZ. Like many grass skippers, Leonard’s undoubtedly benefited from the increase in open land between 1600 and 1850 (Table 1). It was probably quite uncommon in heavily forested pre-settlement New England. Scudder said that he had taken Leonard's "abundantly" on Cape Cod in September, and also on Nantucket; some 17 of his Nantucket specimens are preserved at the Harvard MCZ. Scudder writes that “on Cape Cod and along the southern shore as well as on Nantucket, it can always be found in considerable, sometimes extreme, abundance, but varies elsewhere according to the year” (1862; 1889: 1676; emphasis added). Assuming this is true, Leonard’s has undoubtedly declined on Cape Cod and the southern shore since Scudder’s time, probably owing to development, although late-season concentrations are still reported on the Cape in some years. But on Martha's Vineyard and Nantucket, grazing kept dry grassland open, and Leonard's Skipper by the 1930's was "widely distributed, not rare" on the Vineyard and still "general and common" on Nantucket (Jones and Kimball 1943). For the Vineyard, one 1944 F. M. Jones specimen is at the MCZ, and another (n.d.) is at Yale, along with a later D. F. Schweitzer specimen from Katama Plains (9/30/1982). For Nantucket, there are four specimens in the Kimball Collection at the Maria Mitchell Museum on the island, along with one 9/19/1938 specimen labelled H. attalus which has been re-determined by A. Warren to be an atypical Leonard's Skipper (LoPresti et al. 2013). To Scudder's short list of mainland locations, Farquhar (1934) is able to add specimens from many more areas: Salem, Marblehead, Stoneham, Malden, Lynn, Forest Hills, Sherborn, Milton, and Plymouth in the eastern part of the state, and Amherst, Rutland, Princeton, Auburndale, and Phillipston in central and western Massachusetts. In the central region W. T. M. Forbes collected Leonard's Skipper in Princeton on 13 Sept. 1927, and in Paxton on 28 Aug. 1946 (specimens in Cornell U. Insect Collection). This skipper was also fairly common in the early 1940's around Westport, Fall River, and Acoaxet in southern Bristol County (7 specimens, W. P. Rogers, Yale). At the MCZ there are 1920's specimens from Dennis and Brewster on Cape Cod, and from Stoughton (9/2/1928, Hagelstein). In the 1950's, C. P. Kimball collected Leonard's Skipper in Barnstable (4 specimens, MCZ). Leonard's Skipper may have continued to flourish, at least uncommonly, in most of the state until perhaps the 1950’s, after which it was no doubt negatively affected by loss of habitat due to postwar development (Table 2). In the 1960's C. G. Oliver collected this species in Acton and West Acton (specimens at Yale). In the 1970's, D. W. Winter collected it in Dover, Medfield and Sharon (specimens at the MCZ). In 1971 and 1972, C. T. Parsons found Leonard's specimens on Nashawena and Cuttyhunk Islands in the Elizabeth Islands (Yale; MCZ). In the 1980's D. F. Schweitzer documented Leonard's Skipper at Middlesex Fells in Medford/Winchester/Stoneham north of Boston (9/17/1987), and at Plymouth Myles Standish State Forest to the south (9/25/1982) (Yale). There is reason to be concerned about our eastern subspecies of Leonard’s Skipper today. Cech writes that Leonard's “has undergone a gradual, but persistent decline” over its whole eastern range (2005: 271). NatureServe (2/2010) comments that “This is another of many declining species of open, dry, grassy habitats in the Northeast,” with threats mostly involving habitat loss from succession, decline in pasture land, and development. Leonard's is listed as vulnerable or imperiled in many states or provinces at the edges of its range; for example, it is a species of Special Concern in Maine (http://mbs.umf.maine.edu/Butterfly%20Species%20List%209.htm). Leonard’s is one of our six “dry meadow” grass skippers (Table A). Two of these, Indian and Hobomok, Scudder described as very common, and two more, Leonard’s and Cobweb, as either variable or uncommon. All of these upland skippers had probably increased with deforestation and the growth of agriculture between 1600 and 1850 (Table 1). The first four in Table A—the three Hesperia skippers plus Hobomok--- have probably declined since Scudder and are continuing to decline today, according to BOM-MBC records per trip and list-length analysis (Breed et al. 2012). Crossline Skipper may have increased since Scudder, but may now be decreasing, while Dusted Skipper has apparently been increasing through both periods. “considerable south of Boston; variable elsewhere"
Incredible as it may seem, we do not in fact know with certainty what host plant Leonard’s Skipper uses locally. We have assumed that, like the Cobweb, Leonard’s uses little bluestem in the northeast, largely because it is usually found in dry little bluestem-dominated meadows, however Scott says that only the western “Pawnee” subspecies uses Schizachyrium scoparius. The eastern “leonardus group” is recorded using only Panicum virgatum (switch grass), Eragrostis alba (lovegrass), Agrostis spp. (bentgrass), and Danthonia spicata (poverty grass) (Scott 1986; Scott and Sanford 1981). Gochfeld and Burger (1997: 236) list only these grasses, and not little bluestem, as hosts in New Jersey. Meanwhile, we continue to think of “Lenny” as one of the “little bluestem trio,” along with Cobweb and Dusted. Cech (2005) characterizes Leonard’s as the autumn Hesperia counterpart of the spring-flying Cobweb Skipper. Leonard’s may be more a habitat specialist than a hostplant specialist. According to NatureServe (2010), it is not restricted to undisturbed natural grasslands, but rather to native grass assemblages, often (not always) with little bluestem dominant. In Massachusetts, coastal grasslands seem especially productive. Many observers remark that Leonard’s’ particular preference seems to be dry meadows which are also near damp open areas with good late-season nectar sources, such as joe-pye weed, goldenrod and asters. The species is known as an avid flower visitor, and nectar availability may be a factor limiting abundance. Leonard's Skipper over-winters as an early-stage larva, and may be susceptible to temperature swings or desiccation in warm winter years. Our three Hesperia skippers---Leonard’s, Cobweb, and Indian--- are all about equally Uncommon in Massachusetts today, as measured by 2000-2007 MBC sightings (Table 5). There is no change from the 1986-90 MAS Atlas rankings for these three species; the Atlas found Leonard's "generally uncommon." Of the six “dry meadow skippers” in Table A above, Hobomok and Dusted are somewhat more common than the Hesperia (Table 5). MBC records suggest a strong decline for this skipper in Massachusetts over the period 1992-2009 (regression R²=0.316), with decline especially steep between 1998 and 2009 (Chart 89). List-length analysis of MBC data yielded roughly the same result: a statistically significant 79.4% decline in Leonard's Skipper between 1992 and 2010 (Breed, Stichter and Crone 2012). This was the fourth largest percentage decline among the 100 Massachusetts butterfly species studied. This decline could be a short-term cyclical phenomenon, but there are few reasons to attribute any special cyclicality to this species, when similar species such as Dusted and Cobweb Skippers do not show cyclicality over this period. Only a few other skippers --Hoary Edge, Cobweb Skipper, European Skipper-- declined to a comparable extent during these years. Broadly, the years between 1995 and 2001 (except 1999) seem to have been relatively good years for Leonard's Skipper, compared to the years before and afterwards. During these and a few other years, the high concentrations at the coast mentioned by Scudder were found. 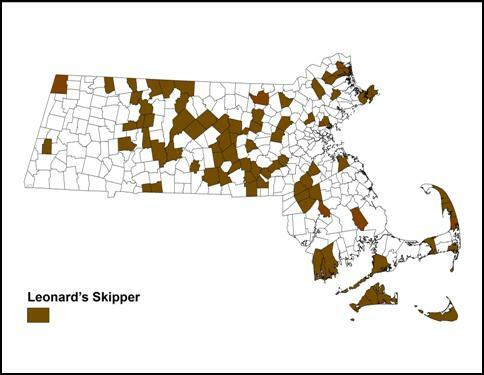 The average number of Leonard’s Skippers per visit to a location declined 62% in 2007, 87% in 2008, and 61% in 2009 in comparison to the rolling average for the preceding years back to 1994 (Nielsen, Season Summary, Massachusetts Butterflies 2008, 2009, 2010). In BOM-MBC 1992-2013 records, Leonard's was found in 85 of the 351 towns in the state. It is well-distributed across the state, north to south, except that it is rare west of the Connecticut River valley (Map 89). Compared to the 1986-90 MAS Atlas, which found no Leonard’s in the central part of the state, this new map significantly extends the known occurrence of Leonard’s westward, showing it to be widely distributed on the Worcester plateau and in Hampshire and Franklin counties. In all likelihood, this does not reflect any range extension, but simply more observers in the field at the right time, looking to add “Lenny” to their life lists or photo collections. There are only two locations reported from Berkshire County in all these years: Stockbridge, 1 on 9/20/2003, M. Lynch and S. Carroll; and Williamstown Mountain Meadow Preserve, singles on 8/28/2010 and 8/26/2011, B. Zaremba, photo on pbase. The MAS 1986-90 Atlas had no Berkshire County reports. Leonard's is also reported, although not in large numbers, from several towns along the northern border in Franklin County: Heath, Leyden, Northfield, Warwick and Royalston. One of Leonard's Skipper's remaining strongholds in our state is Martha’s Vineyard, where the recent checklist describes it as “common to abundant” during its late season flight period (Pelikan 2002). Leonard's is also well-reported from Nantucket, both historically and today (LoPresti 2011), and from Pasque and Cuttyhunk Islands (see below). Leonard’s has not, however, been reported from Naushon or Nashawena islands since the 1970's, or from the Boston Harbor Islands (Mello, 1988, 2003). But coastal locations, for example Rockport Halibut Point TTOR and Wellfleet Bay WS on Cape Cod, are often productive. Amherst/Belchertown Norwottock rail trail, 5 on 9/2/2007, F. Model; Athol South Athol trestle, 8 on 8/29/1999, D. Small and D. Price; Dartmouth Demarest Lloyd SP, 4 on 9/17/2006, B. Cassie; Easton (many reports), max 11, 8/3/1995, B. Cassie; Edgartown, 11 on 8/30/1998, M. Pelikan; Edgartown State Forest, 7 on 9/9/2001, M. Pelikan; Edgartown Wasque TTOR, 10 on 9/14/2010 R. Hopping; Gloucester Wolf Hill Nursery, 5 on 8/22/2012, R. Heil (ph. ); Gosnold Cuttyhunk Is. 6 on 9/21/2013, fide B. Cassie; Gosnold Pasque Is., 14 on 9/17/1998, A. Robb; Leverett, 6 on 8/26/1997, C. Kamp; Nantucket, 11 on 9/10/2005, B. Benner; Northbridge Larkin Recreational Area, 6 on 9/5/2003, R. Hildreth; Oak Bluffs (many reports, large numbers), max 40, 9/6/2000, M. Pelikan; Oak Bluffs Trade Winds, 35, 9/9/2001, M. Pelikan; Rockport Halibut Point TTOR, 29 on 9/13/2011 B. Bowker and L. Stillwell; Sherborn power line, 9 on 8/25/2001, B. Bowker; Truro, max 20, 9/12/1995, J. Sones; Upton Chestnut St. gas line, 5 on 9/9/2000, T. and C. Dodd; Uxbridge Cormier Woods, 2 on 9/9/2001, R. Hopping; Wellfleet (many reports), max 32, 9/20/1996, D. Small; Wellfleet Bay WS, 6 on 9/7/2013, M. Faherty; Worcester Broad Meadow Brook WS, 5, 9/3/2001, B. Walker, and 5 on 9/9/2013, E. and K. Barry. There are several locations which presumably still harbor Leonard's, but which have not been recently visited. One is Myles Standish SF in Plymouth/Carver; the only recent report is 3 on 8/21/2010, M. Arey, but it was documented there in the 1980's. Another such location is Middlesex Fells Reservation in Medford/Winchester/Stoneham. D. F. Schweitzer documented it there in 1987, but there are no recent reports. A. Grkovich has found it in the nearby Melrose/Saugus area (Melrose Lynn Fells Parkway, 1, 8/17/2002). And finally, there are hardly any reports from the Montague sand plains area. Two MBC records date from the early 1990's; the third is 1, 8/27/2000, M. Mello. NOTE TO AMATEUR COLLECTORS: PLEASE DO NOT COLLECT THIS SPECIES. Leonard’s Skipper is univoltine, apparently throughout the whole of its range. According to 1993-2008 MBC records, its flight period in Massachusetts begins in August and stretches into mid-October (http://www.naba.org/chapters/nabambc/flight-dates-chart.asp). It is most frequently seen between mid-August and mid-September. Earliest sightings: In the 23 years of BOM-MBC records 1991-2013, the five earliest "first sightings" are 8/12/2012 Charlton power line, B. Bowker; 8/12/1999 Sunderland D. Case; 8/13/1997 Athol, D. Small; 8/13/1994 Holden, T. Dodd; and 8/14/2010 Worcester Broad Meadow Brook, S. Moore et al. The influence of the particularly warm summers in 2010 and 2012 can be seen. Thus, in five of these 23 years the first sighting has occurred in the second week of August (8/8-14). In another eleven of the years, the first sighting occurred in the third week of August (8/15-21). These dates are slightly earlier than those quoted by Scudder (1889:1677): “...the butterfly does not appear until the latter part of August, generally between the 20th and the 23rd, occasionally as early as the 17th.....” The latter date no doubt refers to H. W. Parker’s August 17, 1874, specimens from Pelham Hills. Scott and Sanford (1981) have shown that Leonard’s flight period range-wide is earlier at higher altitudes and latitudes, and later at lower altitudes and latitudes. Massachusetts appears to illustrate this pattern. Virtually all (22 of 23) of the first sightings each year come from inland towns; in addition to the five just mentioned, examples of other first sightings are Montague 8/23/1992; Milford 8/21/1993; Warwick 8/16/1995; Northbridge 8/17/1996; Uxbridge 8/22/1998; Leverett 8/15/2000; Royalston 8/16/2003; Northampton 8/18/2009; and North Andover 8/18/2011. One year (8/21/2004) the first sighting was in Dennis, on Cape Cod. Latest sightings: In the same 23 years of BOM-MBC records, the five latest "last sightings" are 10/10/1995, Wellfleet, J. Sones; 10/6/1997 Edgartown, M. Pelikan; 10/4/2001 West Tisbury, M. Pelikan; 10/3/1999 Edgartown, M. Pelikan; and 10/3/1994 Wellfleet, J. Sones (also quoted in the MAS Atlas). These are the only years with October sighting dates in the period under review. All other last sightings are in mid-to-late September. One hundred years ago, Scudder said for New England that Leonard’s “has usually disappeared before the end of September” (1889: 1677). The October dates seen here are later than Scudder's, but for the majority of years the "last seen" dates accord with Scudder's observations. As Scott and Sanford (1981) would predict, the majority (15 out of 23) of the last sightings come from coastal locations such as Wellfleet, Truro, Martha's Vineyard, or south Dartmouth. Observational data continue to indicate decline for this species. One concern is habitat loss; since 1950, loss of dry meadows with good floral resources has been significant due to urban expansion and suburban "sprawl." In addition, Leonard’s Skipper could well be retreating northward as climate warms, further reducing its numbers in Massachusetts (Table 6) (Breed et al. 2012). Our eastern subspecies lacks a southeastern coastal plain distribution (for maps see Opler and Krizek 1984; Cech and Tudor 2005). Variations in flight dates by altitude and latitude do indicate some climate adaptability. Life history traits are also relevant. Leonard's remains univoltine. It overwinters as an early-stage larva, so larval mortality may be high. Both these factors limit this skipper’s numbers. For these reasons, Leonard's Skipper is designated here as a Species of Conservation Concern in Massachusetts. Surprisingly, despite similar habitat loss in Connecticut, the Connecticut Atlas in the early 1990's did not conclude there was a decline there, although there were more pre-project than project records (36: 21), and Leonard’s had been a state species of Special Concern in 1992. Many authorities suspect that the eastern subspecies of Leonard's Skipper is in decline over the whole northeastern region (e.g. Cech and Tudor 2005). 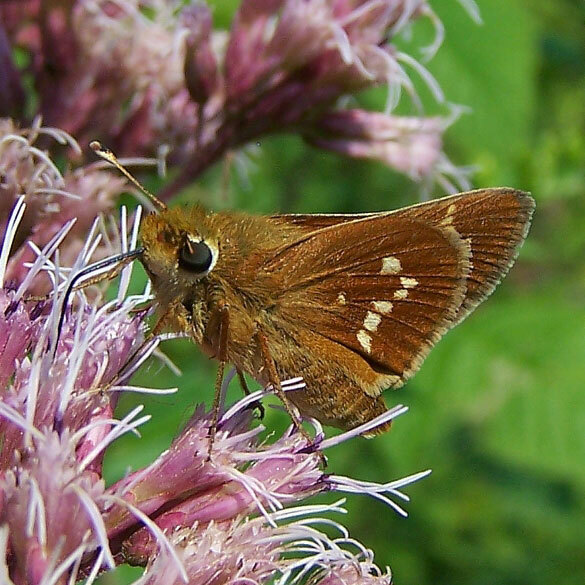 As NatureServe (2010) scientists remark, “any good quality occurrences of Leonard’s Skipper in the northeast are worthy of protection.” In addition, more host plant and habitat research is surely needed. The species’ need for late season nectar sources suggests that gardens may be helpful in enhancing habitat for Leonard’s Skipper. Leonard’s Skipper has been known to fly up to 10 km away from known habitat in New Jersey to show up in gardens for nectar (NatureServe 2010).